There is no denying that Winter is definitely upon us and reports of 30 days of snow are not filling me with confidence. If I could hibernate right now, I would! Alas, life goes on and I really do need to venture outside! 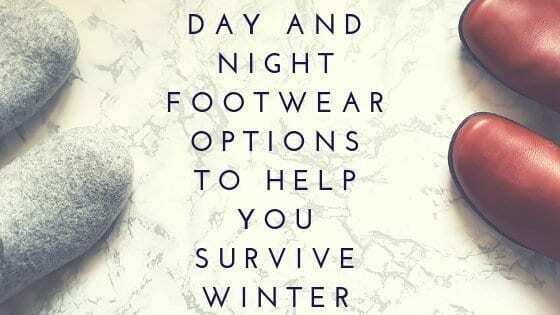 If you are like me, then footwear options to help you survive Winter are very important – toasty toes are a Winter necessity! Fortunately I’ve been putting footwear from Hotter Shoes and Baabuk to the test recently and can definitely say I am now Winter ready! Winter is definitely boot wearing season – what’s better than wearing a pair of snuggly boots in this hideous weather? Ankle boots, knee high boots… the list is endless… and that’s just the line of boots in my wardrobe ready to be worn over the Winter months! Recently I have been rocking a gorgeous pair of Whisper ankle boots from Hotter shoes, priced at £85. A seasonal best-seller, it’s very easy to understand why as the boots are ridiculously comfortable and very stylish with the double zip and slouchy design. The perfect accompaniment with skinny jeans when on the school run! Available in a wide range of colours, whether the boots are leather or suede depends on which colour you choose… or simply choose more than one pair! I love the fact you can choose half sizes in the Hotter Whisper Boots too – I am a bigfoot size 8 and find there is plenty of space in the boots, making them comfy to wear all day long. Hotter shoes are very well made so a pair of these boots will last years! After a day on your feet, slipping into a pair of cosy slippers is absolute bliss, especially if you can close your curtains and cwtch up for the evening. We have laminate flooring so tend to live in thick socks, however Baabuk rescued me by sending a stunning pair of their Jeremy Wool Slippers, priced at € 69.90 EUR for those cold, Winter nights. I have never known anything so comfy, it’s almost as if the Baabuk slippers were made to measure! Baabuk footwear is a total International affair – with their range being designed in Switzerland, all their footwear is then handmade in Nepal using traditional methods. The Baabuk Jeremy slippers are made with thick, felted New Zealand natural wool, with a 100% natural crepe rubber sole. The sole is incredibly robust, giving longevity to the slippers, alongside giving them more grip. With a seamless design, the Jeremy slippers have a really clean and slick look and are very fashion forward. I really do like design, much more like a shoe than a traditional slipper, allowing the Jeremy slippers to remain firmly in place on your feet. The trick to keeping them clean is to dab with a lukewarm cloth – under no circumstances should you put them in a washing machine! The Baabuk slippers are very special indeed, coming with a drawstring cloth bag to keep them safe and clean when not in use. The Jeremy slippers available in light grey, navy blue, vibrant red and turquoise – adding colour to your Winter evenings! If slippers aren’t your thing, then check out the full Baabuk range which features fashionable trainers, winter boot and a kids range. I hope this post has given you some inspiration on how to keep your feet toasty this Winter!